Often, a carded sample would just be used with whatever card was laying around. When this one was put together, it's likely that there weren't any available Return of the Jedi cardbacks, so they simply used an Empire Strikes Back cardback that had a similar coloring to what they had in mind for the final card. 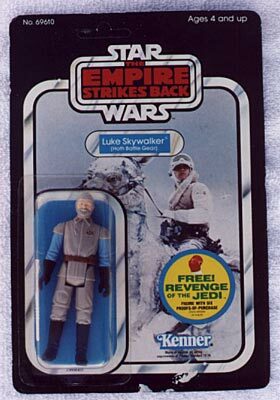 �This sample existed simply to demonstrate the look of the new figure in the usual star wars packaging, with certain color schemes. This particular card is interesting because they used the cardback of a main character.